A browser nowadays is more than a tool for accessing the web. With the right extensions, you can put it to many other nifty uses. Case in point: the Chrome Remote Desktop extension which turns Google Chrome and Chromium into an instant, secure, and hassle-free solution for accessing and controlling remote machines. The extension works on Linux, Windows, and Mac OS X, so you can, for example, access your Linux desktop from a Windows box. 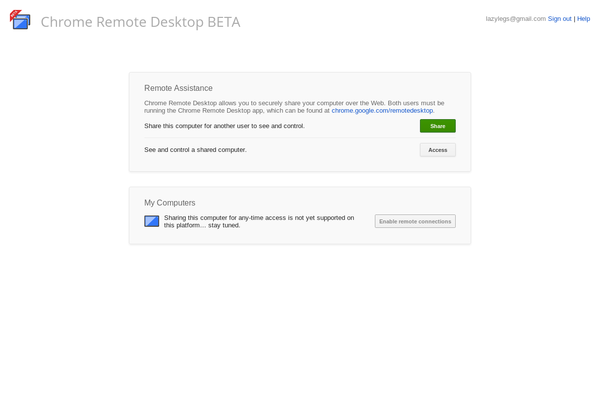 Using the Chrome Remote Desktop extension to access remote machines is ridiculously easy. First off, make sure that the extension is installed on the machine you want to access (remote host) and the client computer. Open the extension on the remote host, press the Share button, and note the generated code. Launch then the extension on the client machine, press the Access button, enter the generated access code, and hit Connect. You should then see the remote desktop in all its glory. The only real limitation of this solution is the fact that it requires the Google Chrome or Chromium running on both ends. But if you already have the browser installed on both machines, then using Chrome Remote Desktop is a no-brainer. Registering computers doesnt work in Linux! This is pretty nice. But the functionality to register your computers and access them from anywhere, which seems a lot more useful because there is no need to generate an access code each time, is not available for Linux. Only for Windows and Mac. So much for a company that runs on Linux!